A stunt kite, also known as sport wings, are specific types of kites that are easier to control, maneuver, and perform tricks with minimal effort. Although they are mainly used for recreation, they also are used for serious flyers who compete in kite competitions. Kite flying competitions are judged much like figure 8 skating, which is based on finesse and technique of the competitor. Find more information about kite competitions here! Technology has advanced far enough however that there are hundreds of different styles, models, and uses for kites. By far the most avid users us them for recreational purposes, and feeling like they are a part of something bigger. The Revolution Family is the only place where you can connect with anyone in the world and who will drop whatever they are doing to meet up and fly with you. This goes for different countries as well. 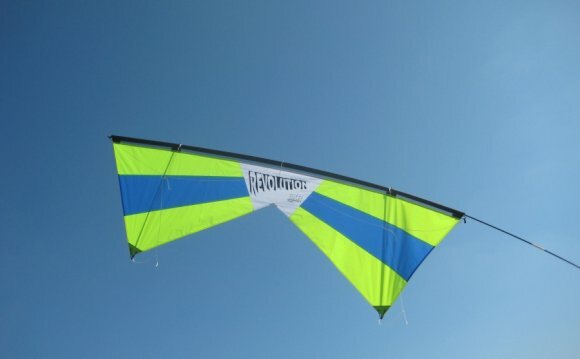 What is the Revolution EXP Stunt Kite? If you are buying your first stunt kite, we recommend that you travel to our forum first to hear what people are saying. In addition, here is a forum thread that talks about the difference between the EXP and the B-Series Stunt Kites. To summarize for you, commentators from our Revolution Family suggest that if this is your first time buying a Revolution Stunt Kite, and if price is important in making a decision, then the EXP is your absolute best bet. What is a Quad-Line Kite? A quad-line kite contains four different strings instead of the traditional one. There are four hookups on the kite, and two handles that each take on two strings (one at the top and one at the bottom). This type of kite technology advancement is what makes the control so precise and amazing to fly. There is literally nothing you can not do with a quad-line kite.